Eerie Magazine: Vintage Horror Comics For Sale | Books Inc.
Eerie Magazine is the vintage horror comic of the 60’s and 70’s. Launched by Warren Publishing in 1966 and sister publication to Creepy and Vampirella, Eerie is a vintage American horror magazine packed with scares and twisted tales of terror! Hosted by the beloved Cousin Eerie, each episode is a mind-bending journey into the bizarre and fantastic! A sorcerer capable of escaping the confines of this mortal coil, and through the Black Arts able to live on in a new body. An artist who captures paintings of terror which are capable of stopping the beating heart. Victims of depraved scientific experiments who exact their terrible revenge upon their perpetrators against all the odds… Eerie has it all! Buy Eerie Comics Online in our digital library. 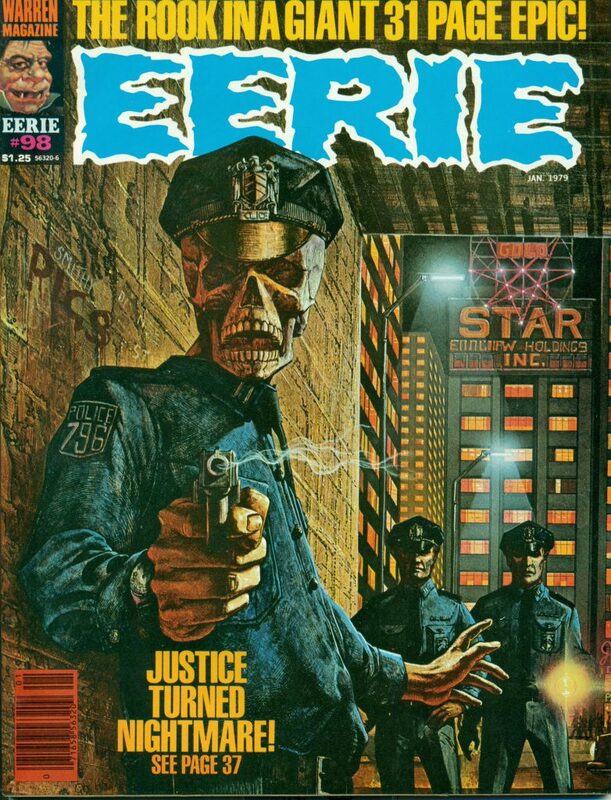 Featuring such famous artists as Steve Ditko and Frank Frazetta, Eerie magazine is personally responsible for haunting the dreams of a generation – ours included. Now you too can revel in the depravity and soul-numbing fear that came with Eerie’s every issue! A bunch of children afraid to check under their beds at night. So much to be grateful for, but the therapy to get over it has been vastly expensive too! Whether you are a virgin to Eerie or returning to this twisted comic like an old best friend, every issue is here at your fingertips through booksincorporated.com! Ready for your terrorised enjoyment! Relive the fears… or find new ones. It’s all here in vintage black and white comic book goodness…or should that be badness? Enjoy… if you dare. Eerie Warren Horror Comics are for sale online at booksincorporated.com. We have the entire collection of Eerie for you to purchase at the click of your mouse. All 139 issues are waiting for you to download. Make every one of your worst nightmares come true! What are you waiting for? Buy now and add these classic horror comics to your digital comic library today!